It was only a few years ago when the hoverboard was invented. Since then, it has virtually become a viral product as the numbers being purchased are soaring. In 2016, a retrofit attachment was brought out that turned any conventional hoverboard in to a hoverboard cart. These add on carts absolutely transform the hoverboard in to something that is way more fun. You watched the video above right!…………… Surely you now want one of those and not just the t-shirt. They are absolutely awesome!!! Now although these units are pretty new right now, there is still a choice on the market, and as usual with any product, not all of these buggies are the same, and we have found a real winner. However, we have looked at all the models that are on the market and inspected each one of them and have come up with the top 4 carts of 2019. 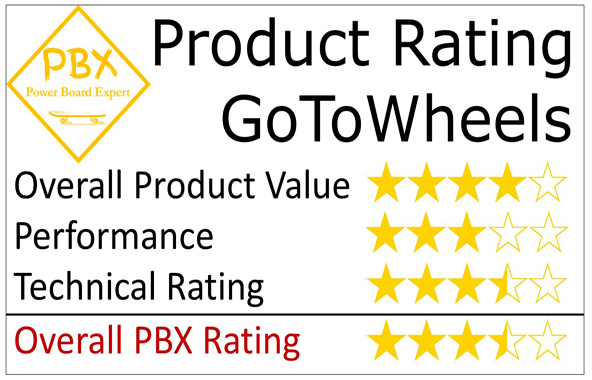 This Kart receives our PBX recommended award. Check out Amazon to see what other people are saying about it and at the time of publishing this review, this product had received a rating of 3.9 out of 5 stars. There are a few features that we like about this model that puts it above the rest. First of all, it has a large 6-inch pneumatic front tire. A lot of karts have a solid 3″ front wheel incorporating a hard rubber or silicon tire. The large wheel enables a smoother ride, especially over bumpier ground. It is also safer than the models with wheels half the size. The issue with small wheels is that if you happen to hit something in your path that is reasonably large (a big stone for example), then the small wheel may not cope as well as a larger wheel that was pneumatic and had some give in the tire. 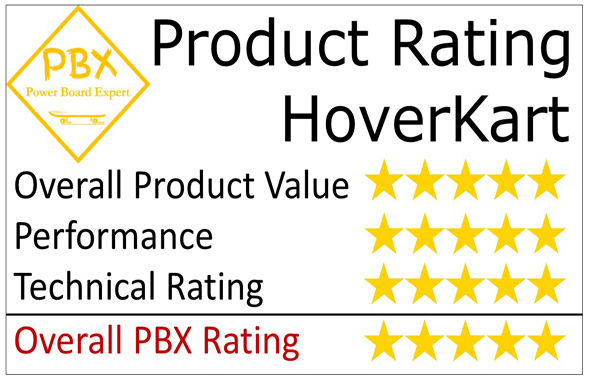 Most models are compatible to fit any hoverboard be it 6.5″, 8″ or 10 inch. The Hover Kart will fit any size, but the carts don’t come with a hoverboard. You have to purchase those separately. If you already have a board, then you can use that to power your cart. You attach your existing hover board to the unit with the Karts velcro straps. When attached, you are ready to go, and enjoy the fun. The ride is fantastic on this unit. 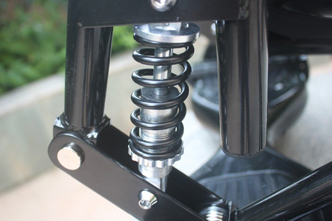 The large heavy duty suspension springs provide an effortless ride that is both fun and exciting. You can go across any ground in comfort as the impressive suspension and the front tire absorb the bumps. This isn’t the case with all models, so unless you are going to restrict yourself to smooth pavements and roads, you should bear this in mind. By and if you haven’t purchased a hoverboard yet, I would recommend that you buy the Swagron T6. It complements the HoverKart perfectly due to the large 10 inch wheels, which therefore enables you to enjoy pretty much any terrain. This model is built for strength and caters for adults and children. 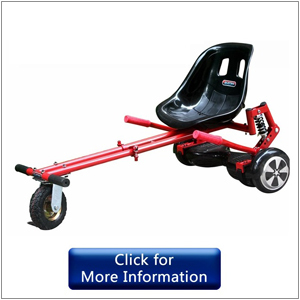 It can effortlessly cope with a load of up to 220 pounds, and it is fitted with a large nicely moulded seat that is comfortable for child or adult. The unit is strong and robust and is made from titanium steel, which means it is not going to buckle up during a ride. Maximum load it can carry is 220 lbs. The Hoverkart is a bit more money than some units, but you get what you pay for most of the time. The cheaper units tend to have issues, so I would warn you NOT to buy one of these on price, but on specification. In my mind, there is no other kart that comes close to this one in quality and versatility. 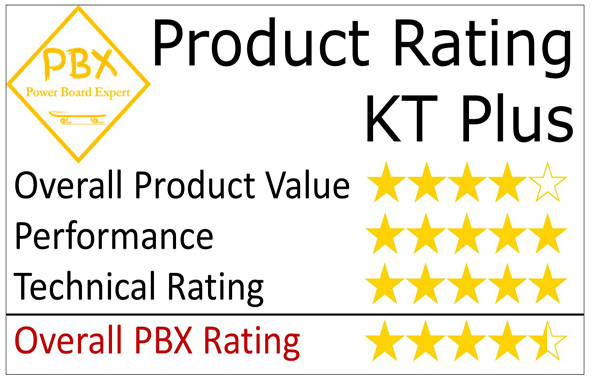 Other models may have a similar specification, but the build may not meet the same standard, and it is the combination of build quality and specification that has earned this unit our PBX recommended product award. The GoToWheels cart is a fairly popular unit. At the time of publishing this review, this model had received 35 reviews on Amazon, and 19 of those are 5 star. The GoToWheels unit is a robust well built model. It weighs 12.4 pounds and has dimensions of 23.5 x 19 x 6.5 inches. 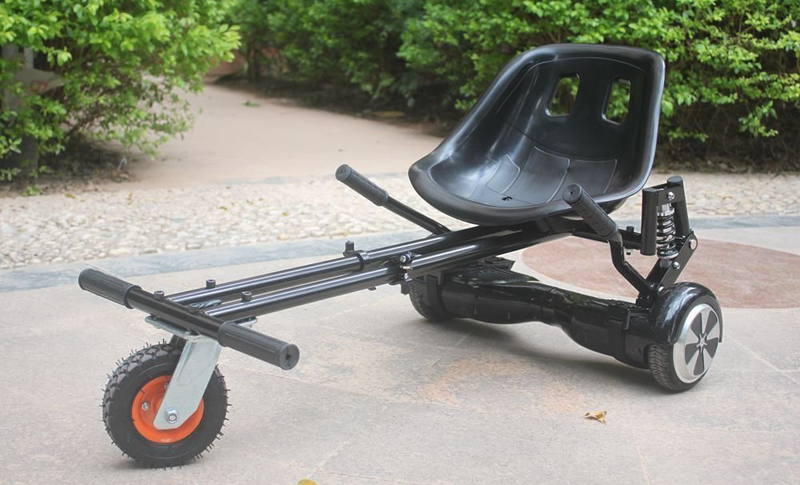 The frame is adjustable to 4 different lengths, so that feature, together with the large comfortable seat makes it ideal for both children and adults to use. We haven’t found any indication of maximum load. However, it is well constructed and we can’t see any reason why it wouldn’t comfortably cope with a person up to 200 lbs. However, the issue isn’t so much a weight thing but rather a size. The seat is large and nicely moulded. However, the width of the seat between the steering poles is 17 inches, and if a user is wider than this at the hips / thighs, then you’re not going to be able to maneuver this thing regardless if you can squeeze in to it. 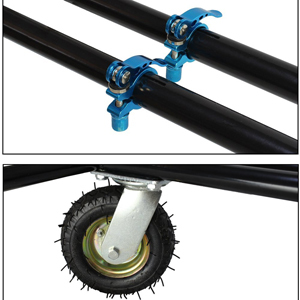 The frame is adjustable up to four different lengths. It can be expanded from 21.3 up to 31.9 inches and can accommodate most people. Like the other models, the cart is attached to the board (which is NOT included), using velcro straps that come attached to the frame. Assembling the unit is simple. You can put it together in a few minutes. 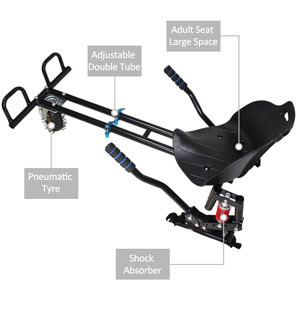 The control of this little buggy is done using the two steering rods or poles fitted on either side of the unit. To go forward and accelerate, simply push the two rods down and keep pressed down. To reverse or slow down, pull the rods up. Pushing / pulling the left and right rods will determine the direction of steer. 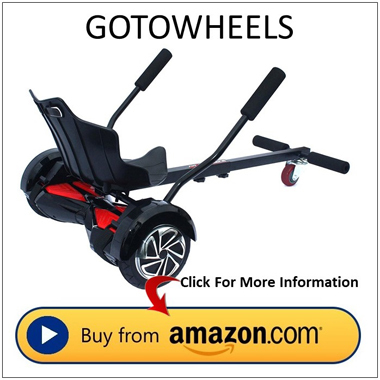 The GoToWheels unit is a decent unit and has a number of features going for it. 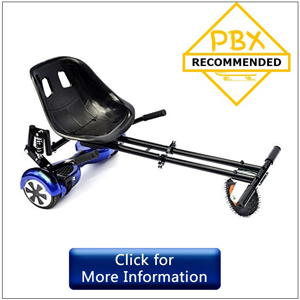 However, it also has a number of features that are not so good, so if you are considering purchasing this unit, you need to consider what terrain you are going to ride on. Even if you plan to use it just on the pavement or road, you need to consider how even those surfaces are, because this unit is not great on uneven surfaces. The build and adjustability of the cart is good though and the seat is comfortable. However, this is not our recommended choice of cart. 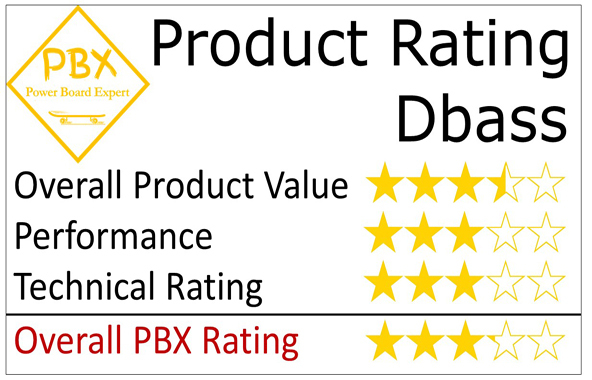 With just 2.4 stars on Amazon and 61% of the ratings giving the product 1 star, it makes you wonder why the dBass is receiving such bad reviews. When it comes to the physical appearance, it is not any different from its competitors. 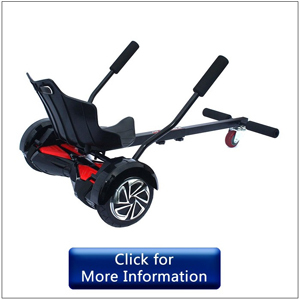 It’s black, has a titanium steel frame that is adjustable in length, and has decent heavy duty shock absorbers on both sides and a 6 inch large size pneumatic rubber front wheel. 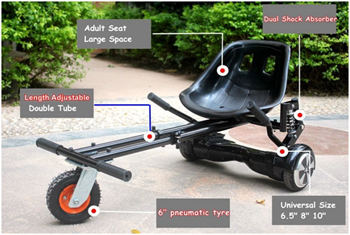 We think these features are outstanding, and not all go kart units have a specification as high as this. 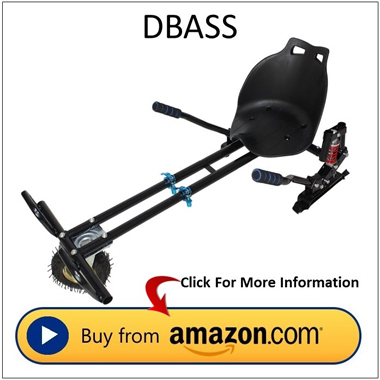 These in our opinion are essential features that ensure for a much more comfortable and smooth have shock absorbers so this is a plus for the dBass. It allows you to have a smoother ride. Also, in our opinion, on uneven surfaces and mixed terrain, these features are a minimum recommended requirement. What we found with this unit is that although the specification is high, the build is low standard. It seems that the front wheel may have some issues, and tends to wobble at higher speeds. Now this may be just the model we looked at and not all are the same, but it is a concern we have, because it reduces the quality of the user experience. This unit can carry a load of up to 260 pounds, so that part is quite impressive. The operation is the same as all other units. If you want to move forward or increase the speed, push the two rods down. If you want to go backward or go slower, slowly pull the two rods up. 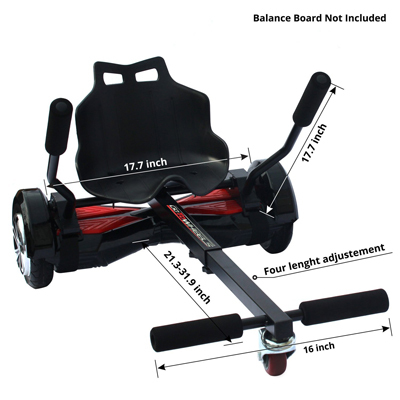 The product marketers call the KT Plus and “upgraded” hoverboard cart. What we found of interest was that this unit had been redesigned from its original model. This new upgraded model has dealt with the issues of poor performance, and now, this model is a serious contender. 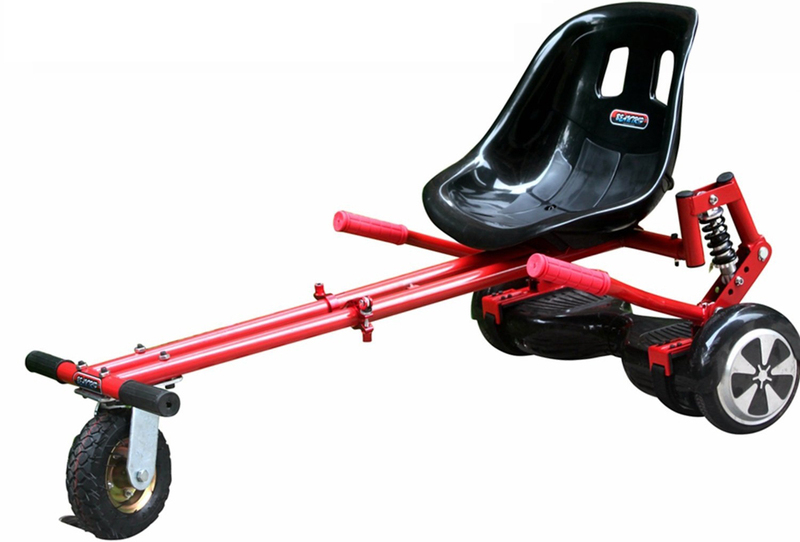 This is a high quality cart, and built to a standard that way out shines other cheaper units with the exception of the HoverKart (our recommended unit). 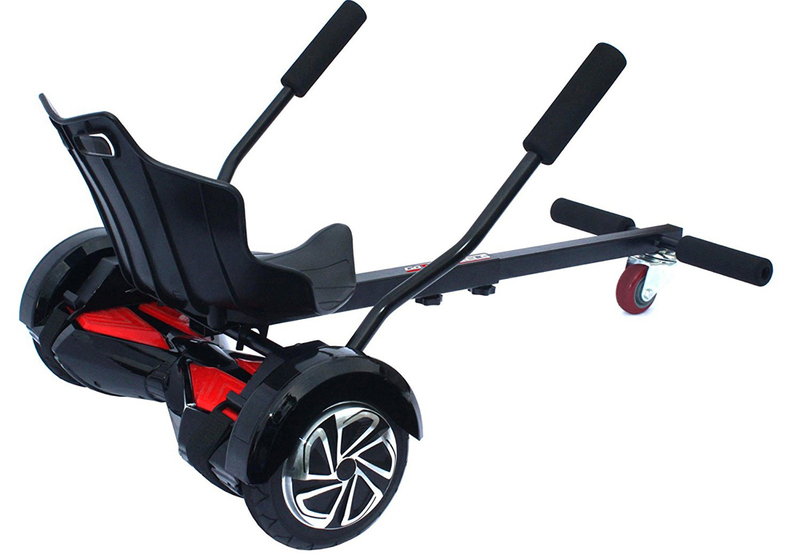 The specification is high as I have said, and incorporates the standard top end specification features including adjustable titanium steel frame, 6 inch front wheel with pneumatic rubber tire, large comfortable molded plastic seat, two Velcro straps for securing the hoverboard to the cart, 2 x heavy duty shock absorbers and 2 x steering rods. This model is a great experience for both children and adults. It is 17.8 lbs in weight and can carry a maximum load of 260 lbs. This conveniently fits an adult of average weight. The good thing about its max weight is that even if you weigh around 250 lbs, you don’t feel any discomfort during the ride. The steering rods are quite low compared to other units. This is not so good unless you have long arms, and it would have been better if the rods were raised a little. 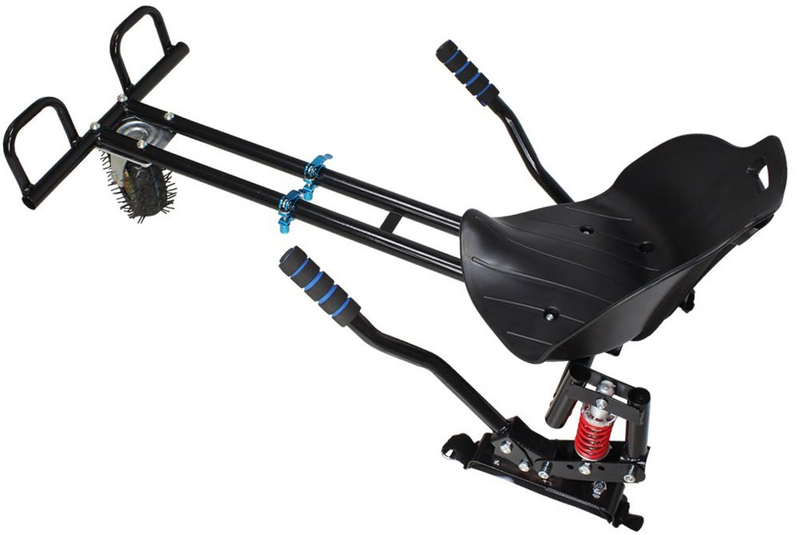 The package comes with a user’s manual, adult seat, a 6-inch pneumatic tire, 2 shock absorbers, 2 velcro straps, and 2 adjustable leg poles. It can hold 6.5, 8, or 10-inch self-balancing hoverboards and the poles where you connect the hoverboard can be adjusted from 19 cm to 23 cm in width. Maximum load is 260 lbs. 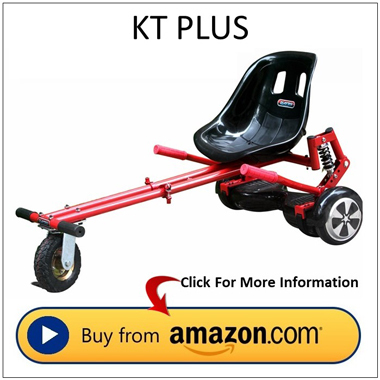 The KT Plus is a great cart, and comes with all the features you would expect the best hoverboard cart to have. The cost however is high compared to other boards, but with a superior build, that is to be expected. We do recommend this model on specification, but feel that the user may not be getting the best value. If cost is not an issue though, we do rate this unit. Q: Do hoverboard carts fit all size hover boards? Q: Where can you use a hoverboard cart? A: A lot depends on the hoverboard you have and the front tire of the cart. 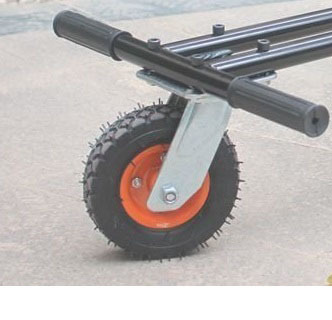 If your board and cart have small wheels, then you will only be able to use it on good even surfaces such as well maintained roads and pavements. 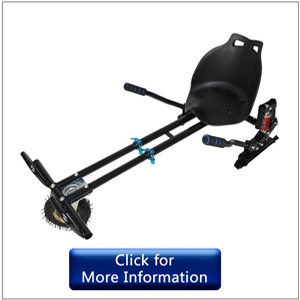 Off roading over gravel, grass and other uneven surfaces will require your cart to have a 6 inch wheel. Also, 6.5″ hoverboards don’t tent to cope well on uneven surfaces, so if you want to go over multiple terrains, you will need to get a hoverboard with at least 8 inch wheels (preferably 10 inch) and have a cart with a 6 inch wheel. 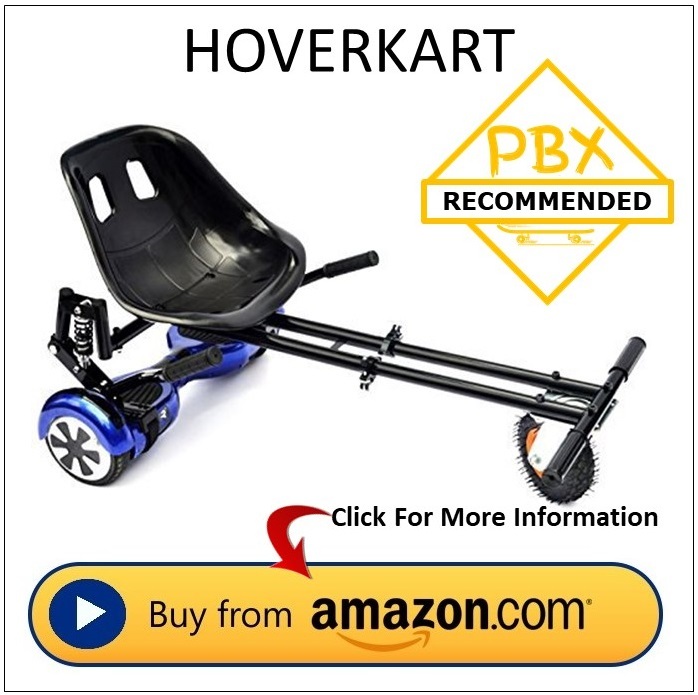 Q: Is a hoverboard cart suitable for children and adults?